The Snow King Pleco (armored catfish) is an invasive species that was likely introduced by aquarium/tropical fish hobbyists who released them into local streams. They are found in many Texas rivers but are especially problematic in spring fed rivers or bayous where the water temperatures do not drop significantly in the winter. Plecos are established in the San Antonio, San Marcos, Comal, and Guadalupe River systems, as well as Buffalo Bayou. 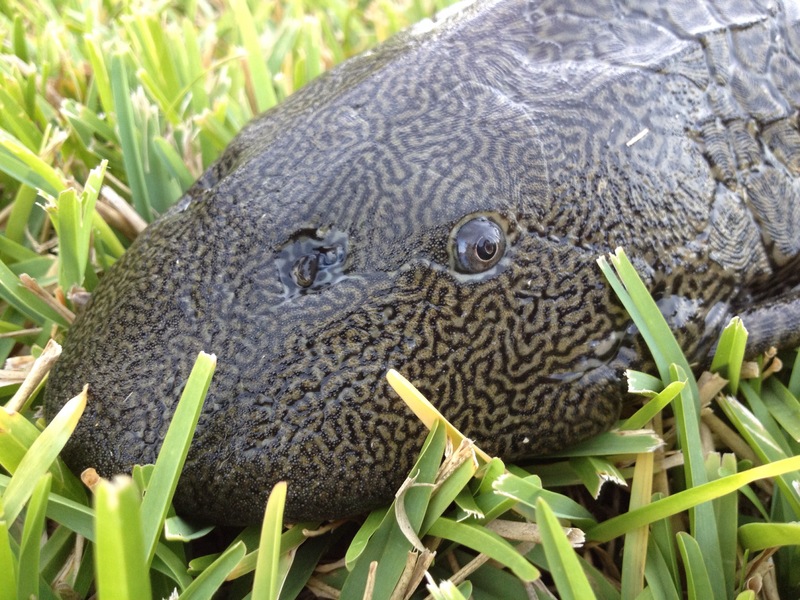 Plecos have been described as one of the most destructive and potentially threatening invasive fish in Texas. These tough, algae-eating fish can withstand a wide range of water quality conditions and can outcompete many native species for space. Their body is dense and bony, and they can survive out of water for long periods of time. Plecos often dig burrows into river walls and embankments which then collapse and erode. This Pleco was inadvertently caught while bass fishing. Caught one (of a pair) about 5-6 lbs in Vero Beach Florida at my mother-in-law’s retirement village. Thought I’d won the “prehistoric fish contest” until I searched the InterNet. The sad thing is that in each of the 3 major lakes (as they call them….nothing but 8-15 surface acre tanks used to collect water for lawn irrigation) I’ve observed grass carp to 40+ lbs, tilapia to 5+ lbs, and Lord knows what else. Having fished in these tanks during visits over the last 10 years,it appears that over time these invasive guys are displacing the bass and blue gills which were originally introduced in the 1980’s. I suspect (but cant prove) that the “lake specialist” has/had dumped the carp and tilapia in to help his efforts in weed and algae control. Naturally nobody knows a thing. Kind of analogous to feral hogs isn’t it? Need to just kill them all. Introduced/invasive species certainly have the potential to forever alter their environment. Kudzu, snakeheads, bighead carp, zebra mussels, plecos, hogs, boas, rodents…. The list is long and growing. Once out of the bag, there’s no way of stopping them. Florida, with its warm climate is especially vulnerable. The one that I see that really concerns me is oak wilt. It is seriously changing the landscape here in Texas, especially in the Hill Country. I understand it is an introduced disease, spread in part by introduced insects, and has yet to be reliably “treated.” My personal observation is that continued drought here has stressed the trees making them even more susceptible to decline. What a shame to see acres and acres of very old oaks wither and die in a very short period of time. The wildlife depending on those trees for survival will suffer. Seems odd to me that it is not the topic of more news reports. Certainly seems newsworthy to me. I suppose nature will ultimately shake things out, but no one really knows what the eventual outcome will be.